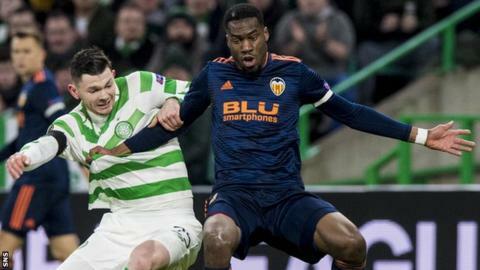 Valencia's Geoffrey Kondogbia has been charged with deliberately earning a booking in his side's Europa League win over Celtic on Thursday. The midfielder was yellow carded for time wasting in the 82nd minute of the round of 32 first-leg contest. The caution means he would miss the second leg against the Scottish Premiership side next Thursday. The case will be dealt with on the day of the second leg by Uefa's control, ethics and disciplinary body.